Dhela FRH has a sprawling campus. 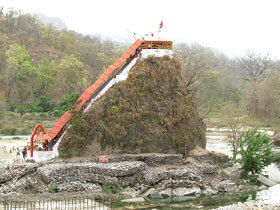 It is located in the buffer area of Corbett Tiger Reserve that was added to it in 1991. The village of Dhela close to the FRH lends its name to it. Walking in the forest for birds watching is a delight anyone staying here can indulge in. The visitors can go for an Elephant Safari or Jeep Safari. Both facilities are provided in the Sanctuary. 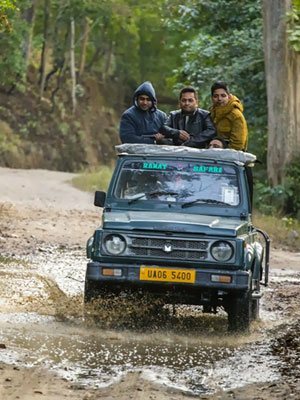 Prior bookings are required for Jeep safari. Tourists can also go for a forest trail with armed guard. This can prove to be real thrilling experience of a life time. Sanctuary is located near Corbett National Park, and tourists can expect to see Asiatic Elephants, Tigers and many other species in their natural Habitat. A vast Laldhang chaur is the main attraction of this zone. The grassland is often seen packed with elephants and Deer. Several wild pigs and Neelgai can also be seen here. The area is also a very sought after place for visitors interested in grassland birds. Sheesam, Dhak, Sisoo, and Khair are the most visible trees found in Corbett. A lot of other varieties are found around the park which contributes to the diversity of species. The only conifer found in the park is Chir Pine, and is seen on ridge tops like Chir Choti and declines in Gajar Sot. The higher reaches near Kanda shelters Banj Oak growing, which is a typical Himalayan species. Kanju (Holoptelia Integrifolia), Jamun (Syzygium Cumini) and Aamla (Emblica Officinalis) are seen growing in major areas. Other main types of trees in Corbett Park. Corbett National Park is home for many wonderful as well as endangered species of animals. The natural bounty and vast landscapes provide perfect habitat for wildlife here. Royal Bengal Tiger, Asian Elephant, Spotted Deer, Barking Deer, Chital, Sambar Deer, Wild Boar, Black Faced Monkey, Rheus Monkey, Wild Pig and Jackal etc. Peacock, Jungle Foul, White Bush Chat, Oriental Pied, Emerald Dove, Red Wattle Lapwing, the Asian Paradise Flycatcher, Rested Kingfisher, Indian Shirks, Indian Alpine Swift, Woodpecker, laughing Thrush, Vulture, Parakeet, kales Pheasant, Oriole, Common Grey Hornbill, Duck, Stork, Cormorant, Parrot, Indian Roller, Teal, Seagull etc. 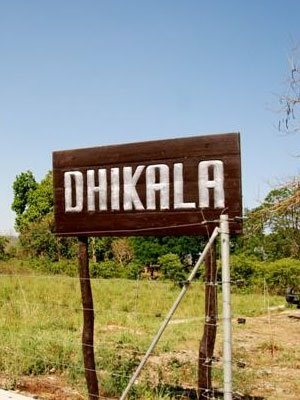 Dhela Eco-tourism zone remain open for tourists throughout the year. The entry for Dhela zone is common with the Jhirna zone and is from Dhela gate which is located at a distance of approx. 15 kms from Ramnagar. Do you have questions before you fill the form? Frequently Asked Questions? Have any kind of issues? Contact us! 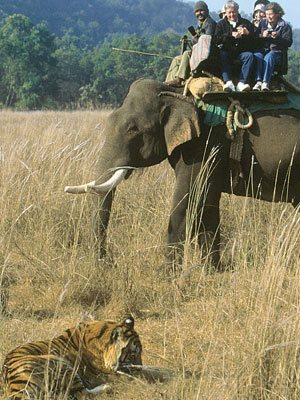 We are private travel company promoting safaris, rooms booking/reservation and other services in Jim Corbett National Park, India and abroad. Some people get confused as they consider this site the official website of Jim Corbett National Park. But, It is not true. www.OnlineCorbettBooking.com is the official website of Online Corbett Booking. This site belongs to such an individuals who deal in corbett safari online booking, forest lodges night stay accommodation online booking and tour packages online booking. We are bound to follow the same rules and regulations which are directed by the Corbett Tiger Reserve & Uttarakhand Government. © 2000-2019 Online Corbett Booking. All Rights Reserved. Site designed & maintained by Saar Software. jim corbett national park : Jeep Safari in jim corbett national park, elephant safari in jim corbett national park, canter safari in jim corbett national park, night stay accommodation in corbett forest lodge in jim corbett national park, hotels in jim corbett national park, resorts in jim corbett national park, hotels resorts in jim corbett national park. corbett forest rest house bijrani dhikala jhirna sonanadi durgadevi dhela in jim corbett national park. 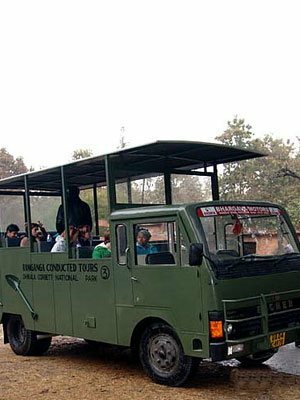 Visit Corbett Facilities Insight Corbett Travelling Inside the Park	Monitoring And Research	Forest Rest Houses Corbett Tiger safari jim corbett national park India	corbett Places corbett elephant safari : online booking and Permit with best price best rates best cost best tariff best services. jim corbett national park : dhikala forest lodge, bijrani forest lodge, jhirna forest lodge, dhela forest lodge, corbett forest lodge. jim corbett national park jeep safari, jim corbett national park elephant safari, jim corbett national park dhikala canter safar, jim corbett national park hotels and resorts, jim corbett national park night stay accommodation, jim corbett national park hotels, jim corbett national park resorts, jim corbett national park best hotels and resorts, jim corbett national park best hotel and resort, jim corbett national park best hotels, jim corbett national park best resort. Online Booking & government official website of jim corbett national park online booking and reservation permit available here.